One fine morning in July, we left our slip at Brewers Sakonnet Marina in Portsmouth, Rhode IsIand, on RazzyTwo, our new Gemini Legacy 35 catamaran, on the first day of a weeklong cruise of Long Island Sound. The wind was from the northeast at 12 to 22 knots, and we expected a nice fast downwind run to our first destination, Block Island, 25 miles away. On board was my wife, Mary Jane, and our friends Jim and Lynda. Soon after leaving the marina we unfurled the jib, intending to run under headsail alone. Once the jib was out it began flopping in the breeze, so I asked Jim to trim it in a little. He did, but it continued to flop around. I went forward to see what the problem was and was shocked to see that the forestay was not attached at the top of the mast—the only thing holding the rig up was the jib halyard. I knew we had to get the sail down immediately so it would not bring down the mast. Fortunately, we were able to furl it back in, and we quickly turned back toward the marina. As soon as we turned into the wind, though, the rig started to sway, with the masthead moving about 6ft back and forth. With the wind now on the port bow, the only thing keeping the rig from falling backward onto us was the jib halyard, so I partially stabilized the rig by making the main halyard fast to the port bow cleat. While it would have been better to attach the halyard to the middle of the foredeck, there was no attachment point there. I thought the port bow would work best as it was on the windward side. On this point of sail the halyard helped reduce the mast sway, but did not stop it, so I took the topping lift and made it fast to the starboard stern cleat. We thought this would provide the optimum balance for the rig since there were no reasonable attachment points in the center of the boat at either the bow or stern. As the radar reflector hurled itself against the shrouds, Jim recommended that Mary Jane and Lynda move into the cabin near the base of the mast where we thought they would be safest, especially if the rig came down. The waves crashed hard on the port side mostly from forward of the beam, creating a severe rocking motion. I was now certain the rig was about to come down, so I asked Mary Jane to call Brewers for help. In response, the yard workers cleared the slip next to the hauling pit and sent a workboat to help us out. When we turned downwind toward Brewers, however, the rig started rocking back and forth worse than ever, and the shrouds were now so loose, they were whipping around as well. To try and fix this latest problem I took a spare line and tied the shrouds together as tight as I could, hoping this might lessen the sway at the top of the rig. But it only helped a little. When we were about to make our turn into the marina, I realized our day was about to get even worse because in doing so we would have to go across the waves. Sure enough, the motion of the boat created havoc up in the rig, and it started slamming from side to side so violently I was certain the mast was coming down any moment. Nonetheless, we began to count down the yards to the breakwater where we hoped it would be nearly calm—100 yards to go, 75, 50, and then finally, with one last lurch, the mast froze like a dislocated finger as we docked alongside the outside slip. We were relieved to see the yard workers all there to help, with Joe Palmieri, the yard manager, giving directions. However, this relief was shortlived when Joe yelled at us to, “Get off the boat now!” From where he was standing he could see what we had not—the mast was almost out of its step and perilously close to collapsing. Luckily, with the help of the yard crew, we were able to stabilize the rig by adjusting the main halyard and topping lift to better center the base of the mast. They then dropped the forestay and jib unit before taking the boat into the pit where they removed the mast and rigging. With the rig down (and our heart rates finally beginning to return to normal), Joe, an experienced rigger, was able to carefully inspect it, eventually discovering that the forestay had failed at the eye fitting at the top of the cable. It looked like it had been sheared off. The end of the cable going into the eye fitting was also splayed out and looked almost shredded. Farther down, the mast base was fluted out from all the rocking back and forth. Joe told me the entire rig might need to be replaced since the wires had been stretched and totally stressed. The aluminum around the stretched-out mast base would now also be fatigued. 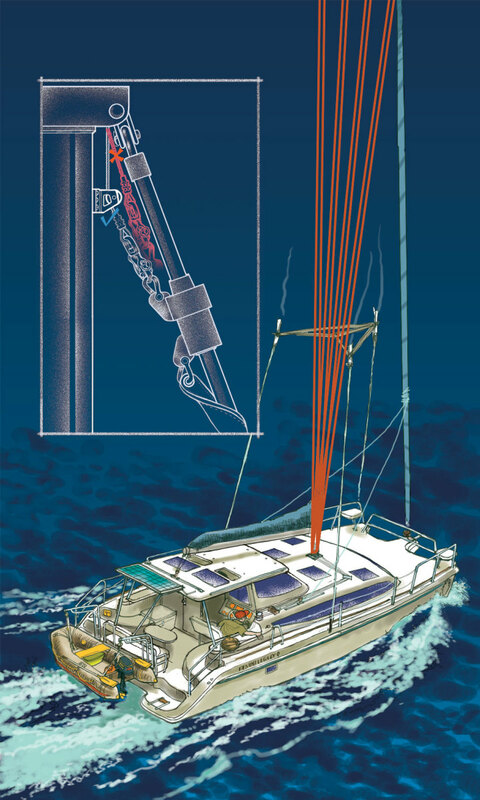 As for the cause of the forestay failure, we eventually found that the jib halyard been wrongly installed, with its lead almost parallel to the forestay. This, in turn, had resulted in the halyard wrapping around the stay each time the sail was furled. This repeated wrapping had eventually unwrapped the strands of the 1x19 wire forestay and gradually weakened it until it parted. To prevent this from happening in the future, we were told that the angle between the forestay and the halyard’s lead from the sheave to the top swivel should always be at least 10 degrees This can be achieved by installing a restrainer or guide below the sheave box. In the end, there was no need to replace the entire rig. The standing rigging has been replaced (the forestay is now rod) and the mast has been shortened by 5/8in. Equally important, our nerves and blood pressure are back to normal. We sail on! Jeff Rasmussen grew up on the Wisconsin coast and bought his first sailboat in 1979. Five boats later, he and Mary Jane bought their catamaran and now cruise the waters around Rhode Island’s Narragansett Bay.